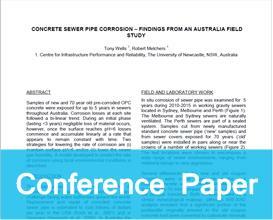 Samples of new and 70 year old pre-corroded OPC concrete were exposed for up to 5 years in sewers throughout Australia. Corrosion losses at each site followed a bi-linear trend. During an initial phase (lasting <3 years) negligible loss of material occurs, however, once the surface reaches pH=6 losses commence and accumulate linearly at a rate that appears to remain constant with time. Two strategies for lowering the rate of corrosion are (i) maintain surface pH>6 and/or (ii) lower the sewer gas humidity. A model developed to predict the rate of corrosion using local environmental conditions is described.